Honda RS 150 is one of the most powerful motorcycles around; it has got all the right looks to impress and a powerful engine to rule the road. In this article, we’ll be discussing all its smart and high-end features that make it so favoured. Starting off with its most impressive feature, the MotoGP DNA inspired world class racing engine that is integrated with class leading advanced technology. With a displacement of 149.76cc, its four stroke 4 Valve DOHC, Liquid Cooled engine generates 16 PS @ 9000 rpm of power along with 13.5 Nm @ 6,500 rpm of torque. As for the transmission, the mill is paired to a 6-speed constant mesh. The accurate and intelligent PGM-FI supplies optimum air and fuel mixture to the engine, ensuring high performance and low emission. Its advanced radiator with the liquid-cooled automatic fan (turns at 103 degree Celsius) maintain constant engine temperature. The RS 150 sits on a twin perimeter frame that provides optimum manoeuvrability, performance and confidence to the driver in the highest of speed. Further, improving its handling is the new sport cast wheels that are inspired by Honda’s big motorcycles and is wrapped with tubeless tires that provide better manoeuvrability and handling. > On the braking front are present wide and big disc brakes, ensuring class leading braking performance. 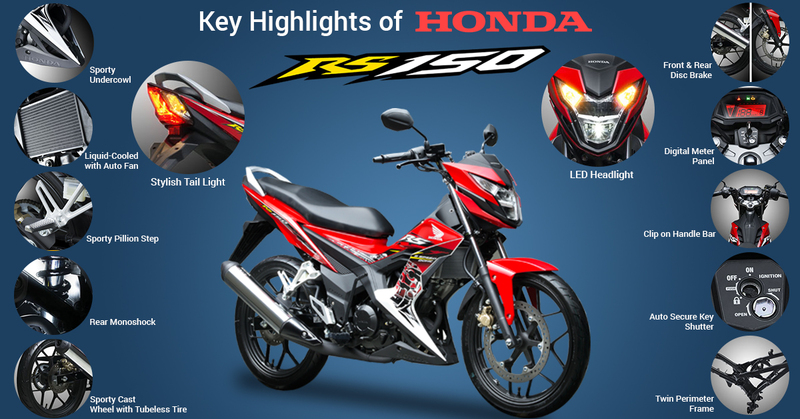 The RS 150 is equipped with many stylish and at the same time high on utility features. Like it has got energy efficient and durable LED light that are fitted in a sharp & sporty looking case. Giving the rider complete information is present a futuristic digital meter with integrated gear & rpm indicator, speedometer, trip meter and much more. To the said list are also included sporty tail lights, an auto-secure key shutter (reducing the risk of thefts) and sporty clip-on handlebar. When a bike is integrated with such a powerful engine, it goes without a doubt that it has a good suspension system, thus ensuring utmost comfort and bump-free ride even on high speed. Honda has equipped RS 150 with rear mono shock dependable for optimum shock absorption. Wrapping up, we’ll say Honda RS 150 has great potential and speed lovers will adore it. The said motorcycle holds a price tag of Php 94,900 price tag and is available in three colour tones – winning red, space magenta metallic and black.